Barry Page was a significant contributor to the development of goal umpiring at VFL level. In partnership with Jim Mahoney he began the professional development of the discipline that has resulted in today’s high level of goal umpiring. Barry Lewis Page was born on 2 January 1935. Beginning as a boundary umpire in 1958 with the VFL Reserve Grade he umpired the 1966 Thirds Grand Final before transferring to the goals. He was equally successful with the flags being appointed to the 1970 VFL Reserve Grade Final, the curtain-raiser to one of the all-time great senior Grand Finals. Prior to his involvement with umpiring Barry was a very good footballer and even better professional runner. He played with Hawthorn Reserves and for Brighton in the VFA. It was only through an injury that he thought might hinder his pro-running career that he gave up football for umpiring. On the track he was successful at Stawell in 1959 taking out the Jack Donaldson Handicap (220yds/£100) and a third in the Bendigo 1000 amongst other successes. 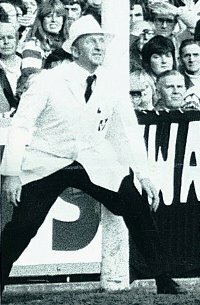 In round 2, 1971 Barry became the 159th goal umpire in VFL history when he was appointed to St.Kilda v. North Melbourne at Moorabbin. In an era of great full forwards Barry only had to wait until his third game for his first ten-goal bag – Peter McKenna kicking 10.7 of Collingwood’s 19.20 against Fitzroy. The 1972 Preliminary was the first of Barry’s ten finals, a fast, exciting game with the Blues getting up in the last quarter. However it was his second final that marked the pinnacle of Barry’s career – the 1973 VFL Grand Final. Having been beaten in 1972, Richmond were looking for revenge in the 1973 Grand Final. The football was tough – as evidenced by the flattening of John Nicholls and the knocking out of Geoff Southby – but also fast and open with some terrific goals from play that had the 116 000 screaming. Neil Balme’s snap from the behind line in the second quarter was a testing decision but Barry handled it calmly as he did the rest of the game. While 1973 remained Barry’s only day Grand Final he was appointed to eight more finals and the 1978 and 1979 Night Grand Finals. Only the work commitments of a Victoria Police administration course kept him out of the finals series in 1977. His police experience was also later put to good use in his annual mock tribunals set up to prepare goal umpires for the rigours of reporting. It also came in handy during the final training session before the 1966 Thirds Grand Final when Barry, arriving late, noticed a stranger rifling through the umpires bags. He locked the thief in a toilet cubicle and called the umpires in to check their bags. A sum of money was discovered missing and later discovered in the toilet cistern where the crook had been locked up. Police arrived and removed the offender and training was over. Some other games of note included the 1975 Tasmania v. South Australia National Championships match at VFL Park, Collingwood’s startlingly inaccurate 9.28 in the 1979 Qualifying Final, the 1975 Hawthorn-North Melbourne brawl involving 34 players and no reports and the following week the tragedy of Neil Sasche’s paralysis. Barry also signalled Kelvin Templeton’s 100th goal in 1978. There was no better way to depart from senior football than a cracking final and that was how Barry went out. Despite never really being in the hunt Geelong were only eleven points down 23 minutes into the last quarter. A goal from Bos and a snap by Bruns virtually on the siren saw them fall four points short. Barry’s ten-year career ended with a total of 172 VFL matches. He was awarded life membership of the VFL Umpires’ Association in 1981 but his contribution to goal umpiring was far from complete. From 1982-1987 he worked as assistant to the VFL’s first goal umpiring coach, Jim Mahoney. They bought a focus on fitness, regular coaching and observation and began giving younger umpires a chance a VFL level. A number of future VFL goal umpire Hall of Famers got their chance under Jim and Barry. They began what is now the career path for goal umpires and led to the high level of skill and professionalism shown by modern goalies. He was as no-nonsense as a coach as he was as an umpire. Roy Ferguson recalls, “It was 1978, my first year on the panel. I rocked up to the Olympic Park training venue. Allan Nash was there to meet me and he took me to our rooms. He told me to grab a hook, change and get ready to meet the other goalies as they turn up. I picked a hook and waited for the guys to arrive. Then the first guy turned up. I had never met him but it was not long before I found out who he was. Later in life Barry moved to Western Australia where he passed away in Perth on 5 December 2012 after a battle with cancer. Now reunited with Jim Mahoney they will probably resume their argument about who is actually in charge.